The Hubble telescope has detected the end of an era in the dwarf galaxy NGC 2976.The galaxy is quieting down after eons of furious star creation, with just a few stars in the galaxy's central core continuing to form. Located just twelve million lightyears away in the M81 group, NGC 2976 should still be going strong when it comes to star formation. A dwarf galaxy, NGC 2976 probably interacted with bigger galaxies around 500 million years ago. This greatly disrupted the concentration of gases in the galaxy, forcing some of it out of the galaxy and the rest inwards to the core. This left the outer regions of NGC 2976 depleted, but it fueled raucous star creation in the interior that will last for about a billion years. Hubble has managed to capture the galaxy about halfway through this process, although already the activity is starting to wind down, with only the innermost region of the galaxy still conducive to star creation. Only a 2,500 light year radius around the core still possesses enough gas to form new stars. The galaxy looks weird because an interaction with the M81 group about a billion years ago stripped some gas from the outer parts of the galaxy, forcing the rest of the gas to rush toward the galaxy's center, where it is has little organized spiral structure. 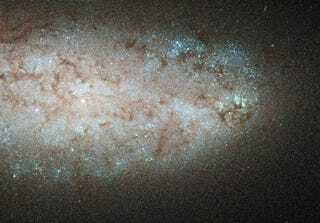 Although technically a spiral galaxy, the structure of NGC 2976 is atypical. It lacks obvious spiral arms, and despite the concentration of gas in the core, it lacks the central bulge common to most spiral galaxies. The galaxy's composition has changed drastically in the last 500 million years as gas continues to pour towards the center and fuel the birth of more stars. Williams and his team estimate there was once five times as much gas in NGC 2976 but this has all been exhausted in a cosmically brief span. Williams suspects that, although NGC 2976 is certainly unusual, it is not really unique, and there are plenty of similar dwarf galaxies that have also been affected by neighboring, bigger galaxies in similar ways. However, this cannot be proven until Hubble can find another dwarf galaxy to examine closely.